Gran Turismo is a staple of almost every PlayStation console. At this point, a PlayStation console without a Gran Turismo game in some form feels like blasphemy (I’m looking at you, Vita). Gran Turismo Sport is taking a while to finally release on the PS4, but as Sony showed us at their booth this year at E3 2017, the wait is nearly over. We went hands (and feet)-on with the game, and have a preview ready for you below. If you happened to take a look at Sony’s E3 booth this year, then you’d be hard-pressed to miss Polyphony Digital’s section. There were eight cockpits, each hooked into a PS4 Pro, running the E3 build of Gran Turismo Sport. These cockpits also included the just-announced Thrustmaster T-GT racing wheel, a $799.99 feat of engineering that has so many acronymic technologies, it’s dizzying. Sony (or perhaps it was Polyphony Digital?) decided to turn up the spectacle on their game to 11. As if it wasn’t enough to have eight players compete in a race, the competition was being broadcast to the audience, which consisted of anyone passing by the booth while at E3, and potentially others watching online. A cameraman filmed some of the off-screen action as well, while an honest-to-goodness sports commentator gave the audience a play-by-play, including pre/post-race interviews with some of the racers, yours truly included (after winning my first race, that is). Each session consisted of two races – a circuit race followed by a rally race, with practice laps before each. Enough about the setup, though. What matters is the game! Well, this is of course the best-looking Gran Turismo game to date, as should be expected. It runs in full 4K resolution, at a locked 60 frames-per-second. Not only that, but HDR is also supported, as is a wider-than-standard color gamut. What this means is that on the proper television, some of the game’s cars will appear more true-to-life than ever before. As Kazunori Yamauchi explained to us in a presentation before our session, at least 10 percent of all cars in previous games have paint colors which fall outside the conventional sRGB color space, so outputting in a wider color gamut will help to reproduce some manufacturers’ color schemes much more accurately, as the game utilizes the BT.2020 color specification. This attention to detail that some gamers might not get to see for a couple of generations’ worth of televisions may feel like overkill, but for motorsport aficionados, no detail is too small to be overlooked. 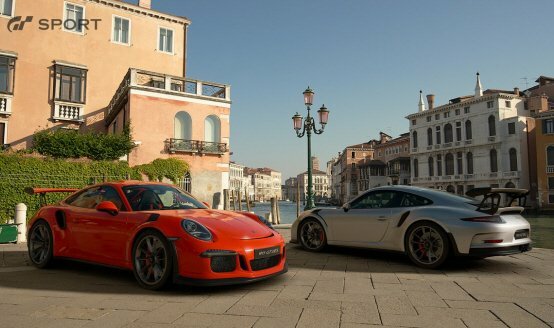 Speaking of small details, it was revealed that Gran Turismo Sport will feature 140 super-premium cars, with their model data captured with the intent to last a decade or more. What this implicitly tells us is that as this new generation of Gran Turismo games takes off, the number of premium car scans will only increase as time goes on. 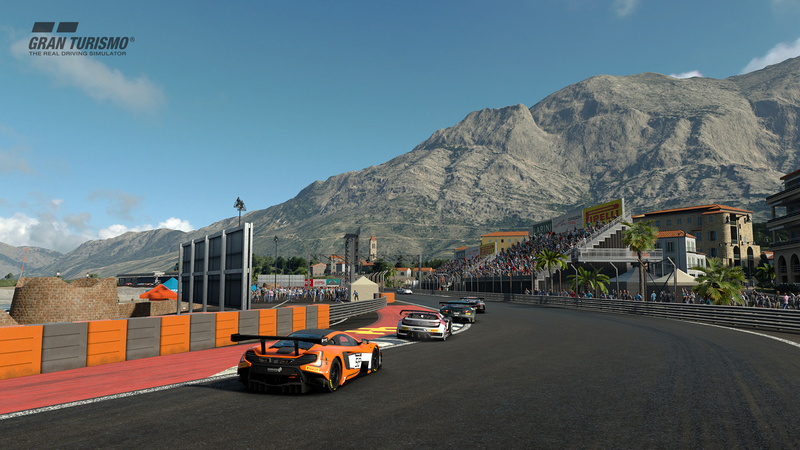 So, a Gran Turismo 7 entry, for example, would start off with as many premium-modeled cars as in Gran Turismo Sport, with the added benefit of adding even more models for its launch. This is exciting news, indeed. Gran Turismo Sport behaves as realistically as you’d expect from a game in this series. Miss your cue for taking a turn at speed by a few fractions of a second, and you’ll quickly find yourself frantically steering in the other direction, raising the risk of a catastrophic overcorrection significantly. The handling models in circuit races versus rally races probably doesn’t change, either – since the game is so rooted in simulation physics, everything behaves exactly as it would in real life. So, losing grip in a circuit race requires a different recovery method than doing the same thing in the dirt. Speaking of realism, the Thrustmaster T-GT deserves a mention here. At the aforementioned ~$800 price tag, this steering wheel is likely priced out of many gamers’ consideration. But it felt so unbelievably lifelike (I had to fight a lot harder than I thought I had to once I started to spin in a rally race) that I started to attempt to conjure up a budget where I could afford such a luxury, before I crashed back down to Earth and realized that I could buy a PSVR headset, lesser steering wheel, and still have money left over for a copy of Gran Turismo Sport. The T-GT is a wheel designed for those of us who are willing to sacrifice to create the perfect environment to play these kinds of games in. The type who obsess over getting lap times down by hundredths or even thousandths of a second. Rest assured, there is a market for these wheels, it’s just probably not most of us, and that’s not only due to price factors. Gran Turismo Sport is a no-holds-barred racing simulator. Now, sure, we were playing in ideal settings, in a cockpit setup that your average gamer won’t be able to replicate. But Gran Turismo is fun to any racing fan, regardless as to how they are playing. Running with all of today’s latest graphical bells and whistles, and then some – 4K, HDR, 60 frames per second, extended color gamut – it’s going to be a hard game to beat on a technical front. Polyphony Digital is poised to give games like Forza Motorsport 7 a run for their money, if Gran Turismo Sport does indeed launch in Fall 2017 as currently scheduled.